Introducing the UltiGuard™ Innovative Dispense & Dispose Container filled with 100 Premium Quality UltiCare™ Insulin Syringes UltiGuard™ is the complete home syringe dispense and dispose system. The patented, tamperproof container provides security and safety. UtliGuard™ is ready-to-use. 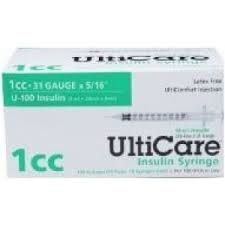 premium UltiCare™ syringes are shipped and stored within the container until needed. With one easy movement, the syringes are discarded into the top of the UltiGuard™ container, virtually eliminating accidental needle sticks. UltiGuard™ is safe, convenient and complete.